“Rabbi, who sinned, this man or his parents, that he would be born blind?” (John 9:2). The disciples asked a fair question. Back then, most believed people who suffered were sinners. Those who prospered weren’t. It seems the disciples saw the man who couldn’t see, scratched their heads, and wondered. What sin could this man have committed before he was even born to deserve blindness? Aha! His blindness wasn’t about him or his parents at all. God meant it for his good so that he would come to know Jesus. But ultimately, God purposed it to display His glory through His works. Jesus covered the man’s eyes with mud and sent him to wash in the pool of Siloam. Bizarre method? I wonder if any snickered and shook their heads as they watched him walk away with mud-caked eyes. Yet, the blind man came back seeing (John 9:6-7). Aha! Still a unique method, but an even more unique man. Perhaps the Messiah? The religious leaders grumbled, but the smiling man and the shocked crowd gave glory to God because of Jesus. It’s easy for us to get so caught up in the miracle Jesus performed for this man that we fail to notice the heavy burden He’d laid on him. Since birth. Imagine growing up blind in Jesus’ day. No governmental programs or support groups formed to make life easier. The blind held little hope of thriving in the world. Surviving was their goal. And yet, so that His works would display God’s glory in him, God planned the man’s blindness from birth. Ouch! Seem cruel? Certainly uncomfortable. All God’s works are perfect. All His ways are just. He does no wrong (Deuteronomy 32:4). Jesus’ love for us is matchless, but our comfort isn’t His highest purpose. Jesus came to seek and save the lost. True. But His highest purpose was to glorify the Father —which seeking and saving the lost does, by the way. God’s glory is the sum of all He is — love, grace, mercy, truth, power, justice, and every good and perfect thing that radiates from God’s nature. His highest purpose is His glory. Not our comfort. Not even His love or justice. And that’s good news for us. 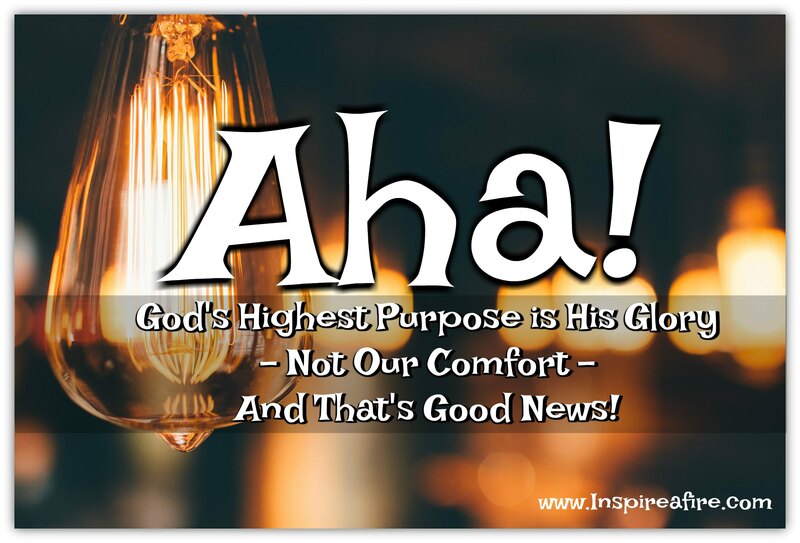 If God’s highest purpose were our comfort, we’d never grow. We’d never come to understand the depth of the sin and evil that lurks in our hearts and turn to our only salvation, Jesus. I was that mom who ran up to the school whenever my children texted me they’d left their homework on their bed. I didn’t want my children to suffer. Ever. My husband taught me to let them struggle so they could become strong and responsible members of society. God reminded me it was when I rebelled against Him and then fell flat on my face that I realized my desperate need of a Savior. If God’s highest purpose were justice, our sin would require judgment. We’d all be sunk. Doomed. If His highest purpose were love, we might suffer continuously and needlessly at the hands of evil because God’s love would overlook justice in favor of love. But because God’s highest purpose isn’t just one of His traits but His full glory, all that He is comes to bear on everything that touches our lives. Including our suffering. God’s love, justice, mercy, grace, power, etc. work together in our lives to reveal His glory for our good. Jesus came to the blind man through the man’s desperate need. Jesus opened the man’s physical eyes and his spiritual eyes to the Light of the world and became his salvation (John 9:35-37). The man’s suffering was the very path God used to bring him to his aha moment. Aha! “Lord, I believe” (John 9:38). When darkness surrounds us, may God open our eyes to see the good news of the Light of His great glory. May we trust in all He is so that His glory will be revealed in and through us. And may we remember that one day our suffering will pass, and we will behold Christ’s glory, share in His glory, and remember our suffering no more (Romans 8:18, Colossians 3:4, 2 Thessalonians 1:10). Jean Wilund is a Bible teacher, speaker, and award-winning writer, passionate about coffee, comedy, and Christ. (Not necessarily in that order.) She blogs at www.JeanWilund.com to encourage people to fall more in love with God and His Word and laugh along the way. She writes for Focus on the Family magazines, Reach Out Columbia, and other great publications. She lives in Lexington, SC with her dashing husband. Their perfect children live scattered across the country. Connect with Jean on Instagram (@jeanwilund), Facebook (@jwilund), and other social media. Beautifully said, Jean. And…me too. I once was blind, but now I see. HaHa! You’re definitely not alone, Ginny. I don’t even want to imagine how much I’ve wasted in trying to convince God as well. His patience is astounding. And my stubbornness can be equally astounding. Oops. “God’s glory is the sum of all He is…” Really appreciated this perspective, Jean! Nice post.